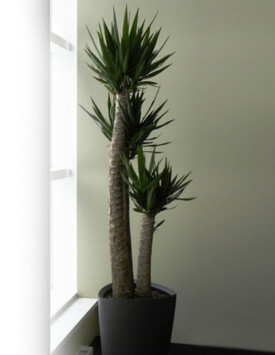 HomeOffice Plants Tips & Ideas5 Things you can do right now to ensure healthier tropical plants! 5 Things you can do right now to ensure healthier tropical plants! Light! Check the light requirements of your plant on a reliable website. Plants that require high light need to be in front of a south or west window, in direct light. Most offices and homes have low to medium light at best, so choose plant accordingly. Plants that do not get enough light will drop their leaves, and the remaining leaves will be yellow and weak looking. There are many beautiful plants that will do fine in lower light. Water! Again, learn about the moisture requirements of your plant. Most plants do best when you allow the soil to dry down a couple of inches before watering. Always feel the soil before watering. Aim to water once per week. Tap water is just fine. Overwatering is often the reason a plant is doing poorly. Fertilize! Purchase a good quality fertilizer formulated for green tropical plants. There is a specific formula for flowering plants too. Fertilizer that you mix with water is best. Fertilize once per month from early spring until late fall. Don’t fertilize in the winter. Your plant goes somewhat dormant during this period and won’t take up the fertilizer. The salt in the fertilizer may then damage the roots. Groom! Remove dead leaves from the plant and the soil. Trim back dead branches. Dead plant material encourages insects. Clean the leaves with a damp cloth periodically. Soil! Use a soil specifically designed for tropical plants. This soil is quite different from garden soil. It is highly porous to allow good drainage and sufficient oxygen to the roots. Make sure it is packed firmly around the plant. Pack it down periodically and add a bit more to the top when the level drops. Not too much at once though, or the roots will not get enough oxygen. Plants rarely need repotting. Most like to have their roots quite crowded. New soil does not add nutrients. Regular fertilizing will ensure your plants have the nutrients they need. This is a popular tropical plant that is relatively easy to care for. It requires very bright light and can tolerate temperature fluctuations. Choose a plant with firm, upright and evenly green leaves with no brown tips or marks. Ensure the canes are not loose in the pot. Inspect the leaves for signs of pests. Mealy bug looks like cotton on the leaves. Place it directly in a south or west window. Feel the soil before watering. It should feel thoroughly dry 2-3 inches down before you water. Remember, the Yucca is a desert plant. The amount of water needed will vary depending on the light and temperature. Ensure the plant has good drainage to prevent rotting of the roots. Fertilize once per month from early spring until late fall.